In its long history, Rolex has released two important moonphase watches. One of the lesser-known models is Reference 8171, released in 1949. 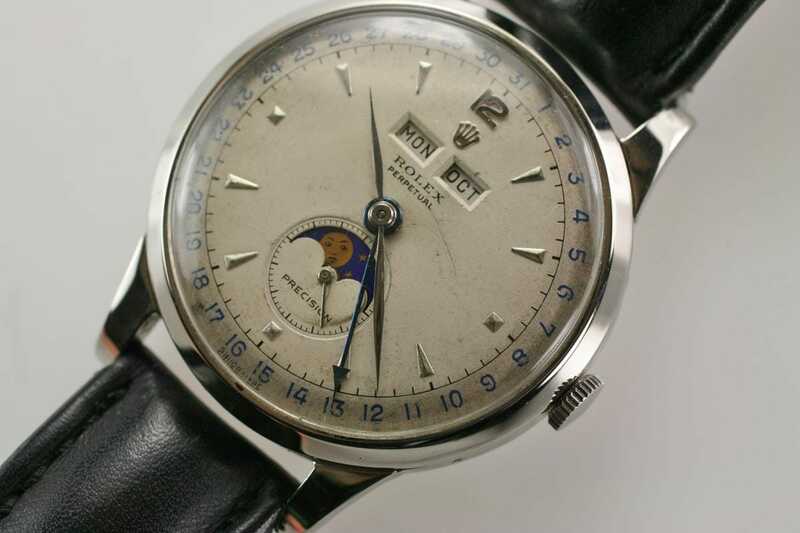 This important vintage watch is a triple date moonphase watch, and was originally available in steel or yellow gold. This is an extremely rare collectors’ piece as only about 1000 of these special watches were made. Because of the watch’s large size of 38mm, it earned the nickname Padellone which means “big frying pan” in Italian. The Rolex Moonphase “Padellone” Ref 8171 was created with a snap back case and engraved with a serial number and the Rolex Coronet. Unfortunately, the rare examples seen today have usually been polished to such an extent that the engravings are often hard to read or completely gone. Many examples also have a replaced case back. 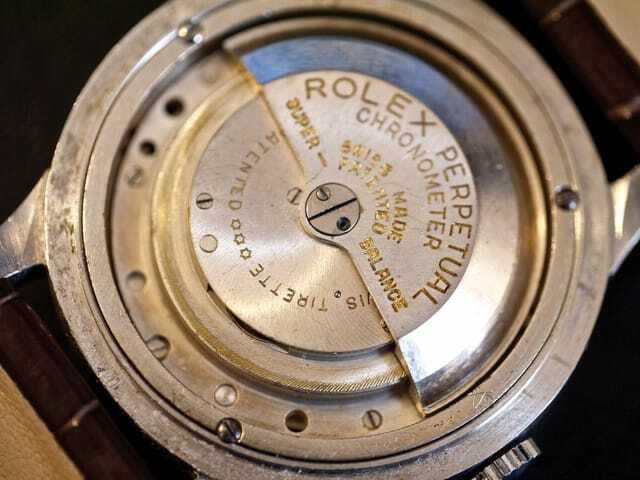 It is hard to find Rolex watches with this reference that is completely original with the engravings still readable. Inside, the watch features a caliber A295 CPL automatic jeweled movement. This extremely complicated movement offers twin apertures that display the day and month. A subsidiary dial for seconds was a fan-form aperture for moon phases and a gilt date hand and outer chapter ring for date. Along with being an extremely complicated watch, it is also very aesthetically pleasing. The moonphase aperture offers a lovely blue background and gilt moon. The white dial offers a crisp and easy-to-read look, despite the many features it offers. The Rolex Moonphase Padellone Ref 8171 is an extremely complicated and rare timepiece. Occasionally one appears on the market for sale. Recently, a Ref 8171 sold at a Sotheby’s auction for $55,000. This prized timepiece is desired for its rarity, complexity and size. 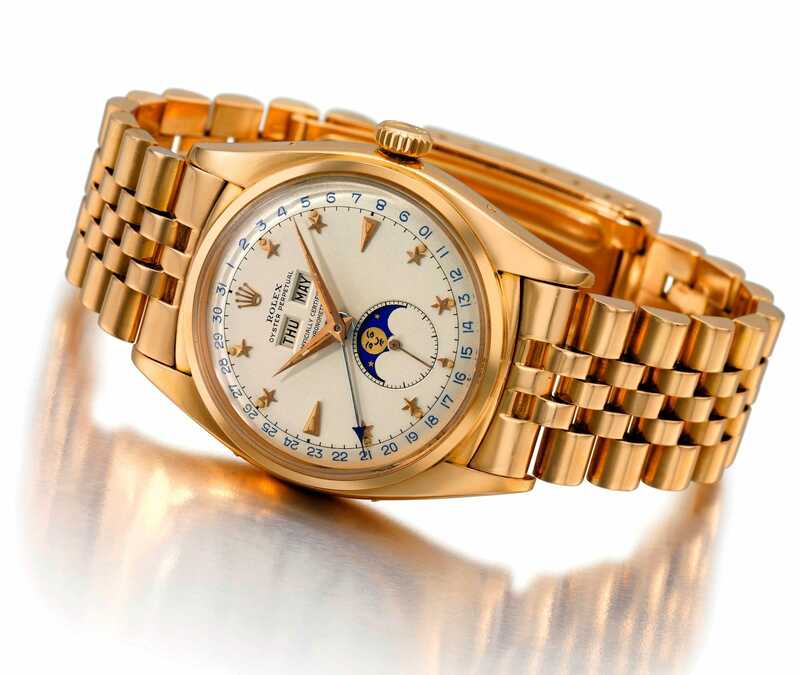 If you are a serious collector and want a beautiful as well as historic gold vintage Rolex watch, opt for the rare and valuable Rolex Moonphase Padellone Ref 8171.